I recently had a dismal experience as a remote participant calling into a client’s project team meeting. I didn’t know who half the other callers were, and it was difficult to get a word in edgewise between all the cross-chatter happening in the meeting room. And sadly, I’m not alone. I’ve heard from many people who’ve called in remotely and who have had a similar experience. Let’s face it: It’s almost impossible to make remote callers feel like they’re on equal footing with people who are gathered in the conference room for the big meeting. But with some thoughtful planning, you can come pretty close. From this perspective of a frustrated remote participant, here are eight virtual meeting etiquette tips for people who plan and run “hybrid” meetings, consisting of people who are gathered face-to-face and those who join from afar. 1. Don’t Keep Attendance A Secret. Even though your web conferencing system may show who’s calling in (assuming that’s how people have dialed in), keep in mind that someone who calls in another way may show up simply as caller #3. And those of you in the room should remember that we remote callers sometimes we have no idea who’s there, especially if people come and go. Even though it may take a minute or two for a verbal roll-call, please realize how important it can be for those of us on the phone to know who’s seated at the table and who’s not. If Mary has dialed in through an online system, I can see when she’s talking by the green phone icon on my screen… But please don’t expect me to remember that Mary is caller #3. For people in the meeting room, unless you are completely confident that your voice is familiar to all, please don’t assume we know who’s speaking, especially if you’re sitting far from the microphone. Even if 95% of the people may know your voice, please identify yourself for the sake of the other 5%. Some people are blessed with naturally resonant voices that require little extra amplification. But most people need some sort of amplification to make sure that everyone can hear them clearly. If you’re seated in the room, make an effort to get close to the microphone when you speak. Otherwise, I will end up asking you to repeat your point, and you’ll end up having to move anyway, or someone closer to the mic will have to act on your behalf. Either way, it chews up time and makes me feel frustrated, especially if it happens a lot… or maybe I’ll just give up trying to hear everyone, put myself on mute, and get back to email. 4. We Don’t Have X-Ray Vision. You may be showing one slide on our shared screen, but those of you in the room may be commenting on something else you’re looking at, such as a handout, flipchart, or another slide. If your conversation veers to something other than that which we can see in our online conference area, please let us know what you’re referring to so we can follow the thread. Better yet, post all documents we may need to discuss in our online conference area in advance, so that we’ll all be on the same page, literally. If this is a big group with a lot to say, I may never get a word in edgewise until it’s 10 minutes after the original point was made. If you’re using a web conferencing tool, be conscious about the need to invite people to comment and ask questions, or to respond to questions or polls every so often. If I speak a different native language or need time to reflect before I speak, it’s especially important to give me ways to participate other than verbally — and I really hate feeling like I have interrupt someone else to make a statement. 6. Cut Out the Chit-Chat. When I hear snatches of conversations, I become confused. Was this a private conversation among a few people in the room, not intended for my ears? Please remember that those of us calling in have no idea how to interpret your conversations across the table. If you must have side conversations, please stop to explain what just transpired so we all feel equally present (e.g., “John just asked Carol if she needed a copy of the report.” Or “If you heard a big sigh, that was Maggie when she saw the size of the slide deck.”). Better yet, eliminate all conversations not intended for everyone. This will improve both our experience and overall meeting efficiency — and is great etiquette for any kind of meeting, not just virtual. 7. Don’t Forget About Me. Even though you can’t see me, I am very much at the table, wanting to feel as an equal participant in the conversation. Ask me what I think from time to time, preferably right up front, rather than waiting until the end, when everyone seems to suddenly remember I’m on the line. Do I really need to stay on the phone for your entire four-hour meeting, or can you arrange the agenda so I am there when it really counts? If I feel like it’s a good use of my time to listen at times I don’t need to actively participate, please let me decide. But do let me know at what junctures I need to be actively involved, so I can plan accordingly. Hybrid meetings, which combine remote and in-person participants, are a necessary evil for virtual organizations. To create a perfectly level playing field, everyone needs to participate exactly the same way, either in the room together, or everyone via phone and web conference. 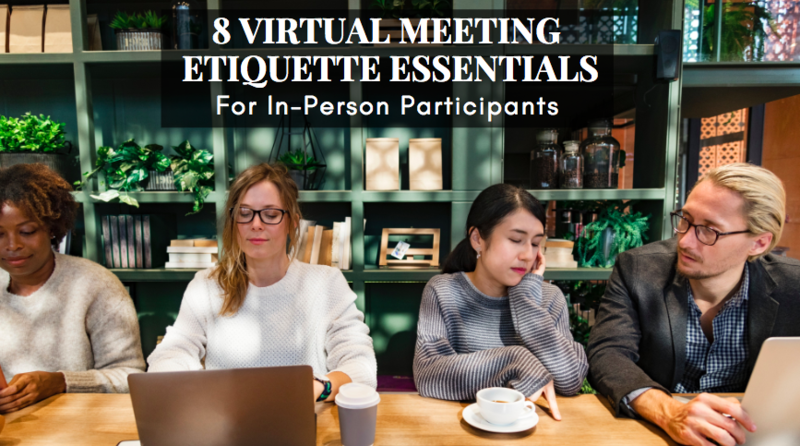 Although this can’t always happen, I hope these virtual meeting etiquette tips can help you create a a meeting environment where remote callers feel like equal participants. And as a result, you’ll get more done in less time when everyone has an opportunity to contribute their best ideas. In 1994 she founded Guided Insights, where she continues to design and facilitate intense working sessions that tap into the best thinking of key contributors working across time zones, locations and cultures. She can be reached at nancy@guidedinsights.com. Our organization works to avoid having in-room and online participants in the same meeting--it just never works well for the folks on the phone. And when you're trying to facilitate the meeting for the folks in the room, you must constantly remind them of the rules that you noted, so it doesn't really work well for them either. People just have lots on their minds, and trying to concentrate on the topic/discussion in the meeting can be a lot, as well as additional rule. Add to it, that we have many non-native English speakers (another layer of stress for them), so it can be a lot for people to keep track of. Great points, Donna! Thanks for sharing. It's definitely a lot more complicated, so I'm glad you found something that works better for your organization.